the Finnish Sauna Fundamentals class visits The Snowdeal Sauna and Endures Stories. 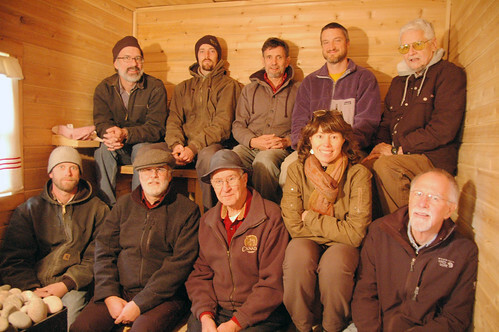 and we find out the answer to how many of driftless folk school finnish sauna fundamentals class can fit in The Snowdeal Sauna. see, that’s why you build a 3 bencher. because you never know who might come over for a visit. i really enjoyed getting a chance to tell them about building the sauna and answering a few questions during their tour of local saunas. of course, they were forced to endure my stories about pulling out 40 cedar logs WITH MY BARE HANDS out of the upper peninsula of michigan cedar swamps, Adventures in Pouring Concrete, collecting genuine upper peninsula sauna stones from The Top Secret Sauna Stone Spot, trenching 150 feet with a ditch witch and eventually raising the snowdeal sauna with a small army of yooper relatives. a perfect captive audience! Previous Posthow to blow the best buy appliance kid’s mind.Next PostFrida the Cutest Treat Fiend. Nice sauna! I take it you didn’t have it fired up for the photo.